This is another activity few Angelinos take part in or even know about. 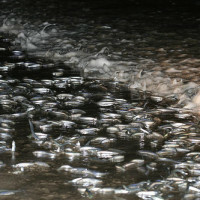 In fact, I’d wager more Angelinos have seen Grunion Runs by accident than by purposely going to the beach at night to see one. So, when the calendar showed it was time for a Grunion Run it had to be covered. Grunion are little silvery fish. Grunion wash in with one wave and bury themselves halfway in the sand, lay eggs and then go back out with one of the next couple waves. Later, the eggs will wash back out so sea in a couple weeks with another high tide. Seeing a Grunion Run is like going to see the Aurora Borealis in that you can‘t predict exactly when it occurs but certain conditions improve the odds. Some nights the whole beach shimmers with thousands of the little silvery fish and other times you get totally skunked like I did last night and you are left watching submarine races. The Grunion make very good bait for surf fishing so many times you see kids and adults collecting them. To take Grunion you need a state fishing license and they can only be collected by hand. This makes for a lot of fun for kids as everyone runs around trying to catch the slippery little suckers. To tell the truth, I knew my chances of seeing a good run last night were less than optimal because the best runs happen when it is illegal to grab them during May and June. Last nights attempt to catch a Grunion Run wasn’t a total bust in that it was a beautiful summer evening out at the beach. To further improve your odds of seeing a Grunion Run, it is best to go to a sandy south facing beach. The Malibu Pier seemed to be a perfect choice. This pier offers a beautiful view of the lights down in Santa Monica. With the full moon shinning over the water these nights are especially serene. I of course had to include a picture of a successful Grunion Run so when the best time of year comes around again you know what to expect.